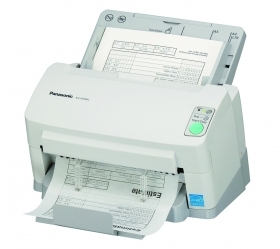 Excellent desktop scanner for bulk scanning. I have purchased over 40 of these over the years. They integrate well with TWAIN applications. Very good a dealing with different paper weights and sizes. Consumables are cheap (You will need to replace the feed rollers every 100k documents scanned). I cant comment on the bundles software as I don't use it. But the driver preforms very well. I have used them in terminal server environments, VDI environments and with thin clients with very good results. The output speed is automatically lowered for documents that are 148 mm or shorter, and the exit guides keep the document from slipping. This stops longer documents from sliding under shorter ones to prevent the output order from changing. The brightness and contrast of scanned images are automatically adjusted, even on documents with varying paper colours and text hues, to produce scanned images with suitable brightness. When a scanned image is missing due to an inadvertently folded corner (dog-ear) or a document that is extremely skewed, scanning is automatically and temporarily stopped. T he user can then decide to rescan, or to continue scanning as is.